When most people ask me what IFMR Rural Channels and Services does, I say “It’s basically Rural Banking. They give India’s poor access to many of the same banking services you or I would get if we opened an account with an HSBC or PNC.” And, for the most part, that’s exactly what it is. Prior to this internship I was a little unsure of what our experience would be like-in the weeks building up to the start of our time here, Leah and I learnt that it’s not a traditional Microfinance Institution nor is it a non-profit organization, as we originally expected. With outside equity investors and banks that lend to us on a regular basis, there is a constant push for profitability and sustainably. When we met with Senior Management in our first week, I asked the question, “How do you walk the line between being a for-profit company and serving communities that essentially, are some of India’s poorest?” And I was quite satisfied with the response I got- at IFMR, there is a belief that merely providing financial services to the poor and the under-banked is socially impactful in and of itself, which makes sense to me. They make it a point to be open and honest with every customer they serve- there is no desire to trick customers into taking loans they cannot afford and there are checks and balances in place to ensure that individuals who are in charge of loan disbursements are not driven by personal incentives. Interestingly enough, this argument aligned very nicely with a theory we learnt in my business ethics class last semester, which stated that businesses can be profitable from and thereby should provide goods and services to the poor. The author even went on to argue that firms have an ethical responsibility to do so; it was an interesting read and the longer I work at IFMR, the more I’m convinced of his argument. Overall, IFMR is a large organization with many sub companies. IFMR Rural Channels and Services ( the specific sub division I work for), handles a lot of the consumer facing tasks like actually providing loans, as well as raising money from 3rd party investors to sustain themselves, as any bank would. They have 6 KGFS’, which are their on-the-ground-headquarters that are in charge of overseeing the day to day banking services. Each KGFS caters to a separate district in India and has several smaller branches (stalls set up in villages that customers can go to enrol and purchase products). Currently, they have 4 branches in Tamil Nadu, 1 in Orissa and 1 in Uttrakhand. Although each KGFS is run by its own set of managers, they tend to offer shopkeeper loans, jewellery loans, livestock loans, agricultural loans, traditional woman-only group loans that other Microfinance Institutions offer, educational loans, emergency loans, insurance and some others to rural India; it’s really quite incredible how comprehensive and broad their portfolio is. My main project for the summer is to do research on various districts in India, and present them with a final list of 5-10 districts where they could potentially set up their next KGFS headquarters. It involves determining or refining a measurable metric for each screen (requirement for the next KGFS) and then passing the list of districts through those screens depending on how they perform with regards to a particular metric. So far, I’ve narrowed down the list from 152 potential districts to 46, though now is when I have to do even more rigorous research- hopefully, I do this process well enough so that someone can visit these 5-10 final districts immediately after I’m done with my internship to do an on-the-ground evaluation of each district. I’m also working on an informational PowerPoint with Leah and our two supervisors (Zach and Nishanth) for equity investors for one of the KGFS headquarters. Additionally, I help Zach with day-to-day assignments, mostly related to analysing and evaluating the riskiness of customers (something I find quite interesting). So that’s everything on the work end- other than that, 3 interns from Stanford have joined our company- they are a great group and it’s to have more people in the house and to go out with in the evenings. This weekend we actually went to Ponidcherry, which is a rather bizarre little town with some very good food and surprisingly pristine looking buildings for India. Class of 2016 undergraduate student at the University of Pennsylvania. Currently intending to study Finance and possibly Operations. 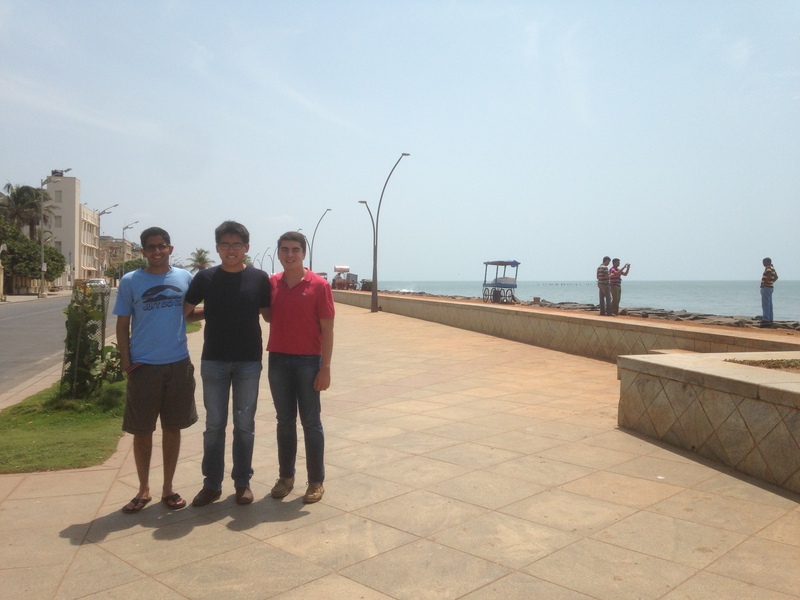 Intern at IRCS in Chennai for the Summer of 2014 (sponsored by CASI).